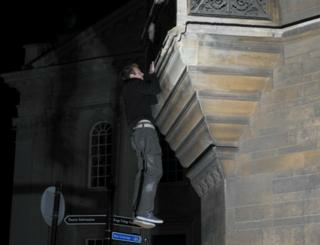 "At this very moment there may be a dozen climbers on the buildings of Cambridge. They do not know each other; they are unlikely to meet. And inadvertently they will find what we found, a love for the buildings and the climbs upon them, a love for the night and the thrill of darkness." This is the passage that concludes The Night Climbers of Cambridge, a 1937 book that remains an influence on those with a head for heights in this famously low-lying city. The tome describes a familiar skyline: the four piercing spires of King's College Chapel, the tower of St John's, the pale Portland stone of the Senate House. And for decades, a clandestine group has sought distraction from the monotony of study by scaling some of these landmarks. 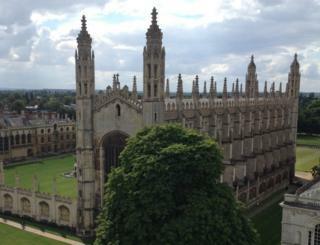 "If you like mountaineering or rock climbing, Cambridge is probably the worst place in the whole of Britain to be," says Tom Whipple - now science editor at The Times - who tiptoed across the rooftops as a restless maths student in 2000. "I'm used to modern plastic drainpipes, but these were really sturdy cast-iron ones - you could get your hands behind them and climb. "Sitting up there in the fog, the clocks are chiming midnight; you cannot see anything of the modern world. "You flatter yourself; you feel part of this secret society, this continuum. I was hooked." Whipple talks of abseiling into the Trinity Ball in a dinner jacket - and the kudos to be gained from "leaving a wheelie bin on New Hall dome". "The fear of getting caught was more intense than the fear of injury," says Rebecca Wetten, who studied history of art between 2010 and 2014. She says her favourite climbs were at the New Museums Site and the Faculty of History, which is noted for its resemblance to an open book. "None of the climbs needed special equipment but you worked out a pattern to them; you needed someone who knew the way and would help you figure out shortcuts. That's why it was good to do it as a pair." And although membership of a club isn't necessary to partake in this renegade pastime, it does appear there is a shadowy group dedicated to night climbing. A reporter with Cambridge student newspaper The Tab, who in March 2016 followed a small group on the rooftops, claimed to have seen a list of 24 initiation questions for night climbers who hoped to join a secret society dedicated to the practice. These ranged from "How close have you come to dying? ", "Do you ever have to consciously prevent yourself from deliberately jumping when you find yourself standing on a cliff or rooftop? ", to the apparently irrelevant: "What do you know about central banking and currency laws?" Looking up at the rooftops, tourist Leo Hayes, 70, who is visiting Cambridge from Ireland, is incredulous to learn of the activity. "Just one word: mad," he says. "Risk your life for nothing except a dare? Jumping between buildings? Crazy." In 1899, British mountaineer and poet Geoffrey Winthrop Young was the first person to document the activity in his book The Roof-Climber's Guide to Trinity, written in part as a parody of an alpine guidebook. The third edition in 1960, edited by Richard Williams, describes the practice as "like cat burglary, but without the robberies". But 1937's The Night Climbers of Cambridge, by Whipplesnaith - the pseudonym of the author Noël Howard Symington - is the publication that is credited with inspiring generations of night climbers. It describes in detail the routes up particular colleges - and indeed the routes off them: the "Senate House leap" is achieved by jumping across the 6ft (1.8m) gap between the roof of Gonville and Caius College and the neighbouring Senate House. Jon Gifford, of Oleander Press, which reprinted later editions of Whipplesnaith's guide, says the work has "great literary appeal", with language that's "evocative of another age". "It is melodious and romantic," he says. "The thrill of being alive and one with nature, in many ways. "But it was also about civil disobedience, letting off steam, about risking lives." Tom Whipple, who was given a copy by his father, remembers a particular passage with fondness: "As furtively as the bats of twilight, they shun the eyes of the world, going on their mysterious journeys and retiring as quietly as they set out." Whipplesnaith also writes of injured backs and torn trousers, of near misses and scorched hands - although no-one is known to have been seriously injured or killed. 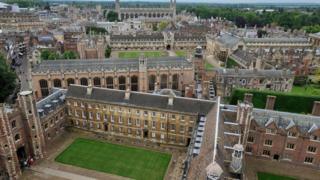 Two students were rusticated, or dismissed, by their colleges for climbing King's College Chapel in June 1937. 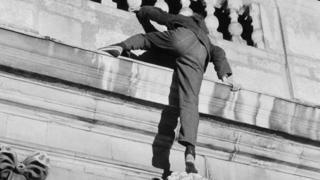 Another two were also "sent down" in the early 1960s after they were caught by police trying to scale the Senate House. "One moment we were protected, isolated students, the next we had been abandoned, jobless, penniless in the last stages of a degree course," one of them wrote. The Fleet Street photographer and filmmaker John Bulmer - an engineering undergraduate between 1957 and 1960 - was "asked to leave" King's College six weeks before his finals after one of his images "caused upset" when it appeared on the front of The Sunday Times. 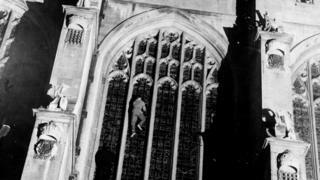 "It was a photo of a climber on King's College Chapel window. I was hauled up before the proctors," he remembers. "The college was dissatisfied that I was spending more time on photography than my studies." 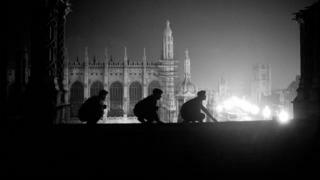 The image was part of a feature written for Life magazine, which saw Bulmer, armed with a Canon 35mm and "big old-fashioned flashbulbs", following Cambridge's night climbers. "It was challenging, but the aim with any photograph is always to kick the viewer in the gut," he says. 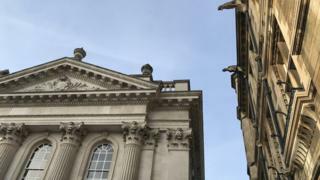 These days, Cambridgeshire Police "strongly discourages" the practice on safety grounds, however the force says that no crime is being committed by night climbers, as long as damage isn't caused to the buildings. The Royal Society for the Prevention of Accidents has previously warned urban climbers not to let an "appetite for adventure" override safety concerns. It points out that any accident affects not only the climber, but their family, the emergency services and staff who work on the sites. 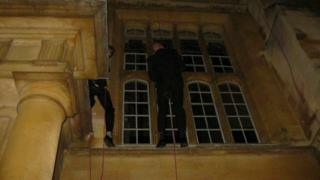 Trespassing, police say, is mostly a civil offence, although night climbing can be considered a "public nuisance". That's certainly how it must have seemed to the university over the years - although it declined to comment for this article. 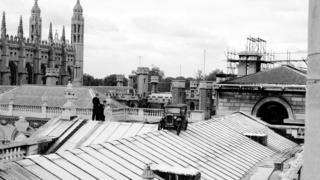 In June 1958, a battered Austin 7 appeared on the roof of the Senate House overnight. Seven years later, a banner reading "Peace in Vietnam" was attached to the lightning rods on the spires of King's College Chapel. And in November 2009, climbers scaled an 80ft (24m) external wall of the chapel to fix four Santa hats on the pinnacles. Ian Gray, the porter at King's at the time, says he and the college chaplain went up on to the roof to try to poke off the festive headgear with a stick. "As it transpired the hats were on the very top of the spires and there was no way us less daring types were going to go up there and get them down," he says. "I remember at the time just saying, 'wow - that is quite a feat'." 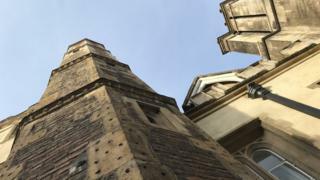 In the end, a steeplejack had to "rescue each one in turn at great expense". Andy Buckley, now a particle physicist at the European Organization for Nuclear Research, was a night climber during his time as a physics student between 1997 and 2005. By the time he had arrived at Cambridge, the contours of the colleges had barely changed from the days of Winthrop Young, although CCTV cameras have been installed, as have wall-top spikes in a bid to deter nocturnal ascents. "I was secretary of the climbing club at the university, and it had this old book about night climbing, and I thought it was a good yarn," he says. "A lot of the building work was decaying and I felt bad about the possibility of damaging them. 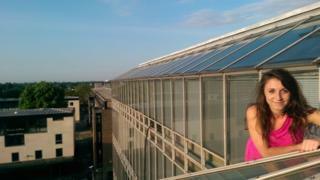 But you could shinny up the drainpipe and get a fantastic view into the inner sanctum of the university. "You feel very exposed up there but you see the structures very differently." For Rebecca Wetten, scaling the heights of the Faculty of History is an enduring memory of her time in Cambridge. "I threw off my shoes and climbed it in my May Ball gown, in my bare feet, and saw the most wonderful sunrise," she says. "It was an amazing send-off for my final year. "No-one can take that from me." You can hear more about Cambridge night climbing and other stories on the theme of "Secrets" on the BBC Multi Story podcast on the BBC Sounds app or on the podcast's website.